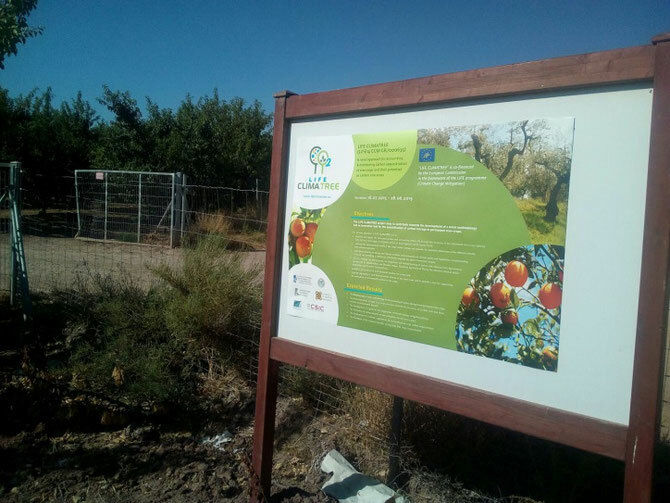 Two notice boards in Spanish Language have been installed in Santomera orchard and Campotejar orchard, both in Murcia Region, where experimental activities are taking place. 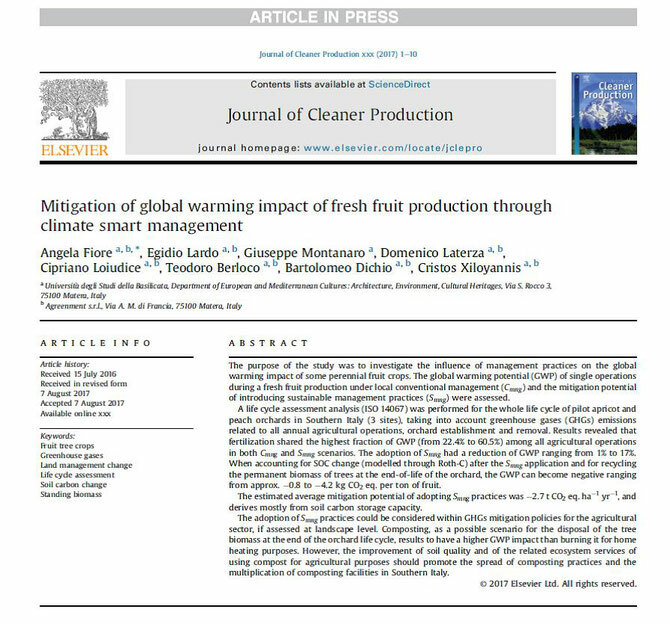 DiCEM finalised the acceptance of the paper titled “Mitigation of global warming impact of fresh fruit production through climate smart management” now in press for the international journal “Journal of Cleaner Production” (Elsevier). AUA team represented LIFE CLIMATREE in Brussels Green Week. 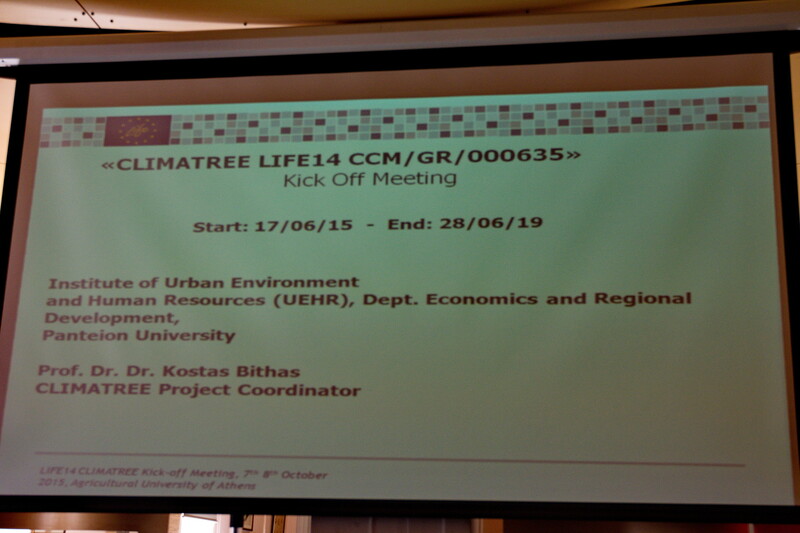 Contacts with LIFE Task Force (LIFE14/CAP/000003/GR) for the participation of LIFE CLIMATREE in the 25 years LIFE celebrations taking place in Athens (16-18 May, 2017). 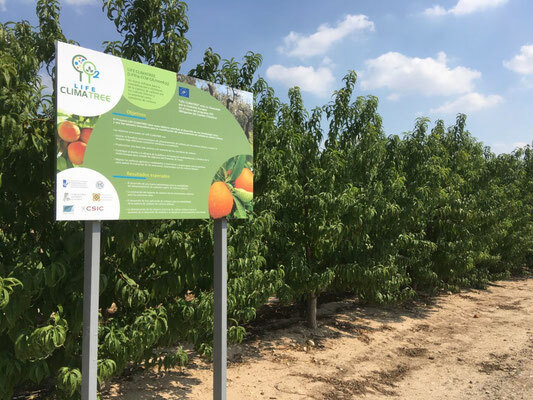 DiCEM submitted an abstract titled MANAGING CARBON FLUXES IN PEAC ORCHARD for the IX International Peach Symposium, to be held in Bucharest, Romania, from July 2 date to July 6, 2017. CSIC assisted to INIA FORUM “MANEJO DEL SUELO Y CAMBIO CLIMÁTICO” in Madrid for Dissemination of project’s progress and results. 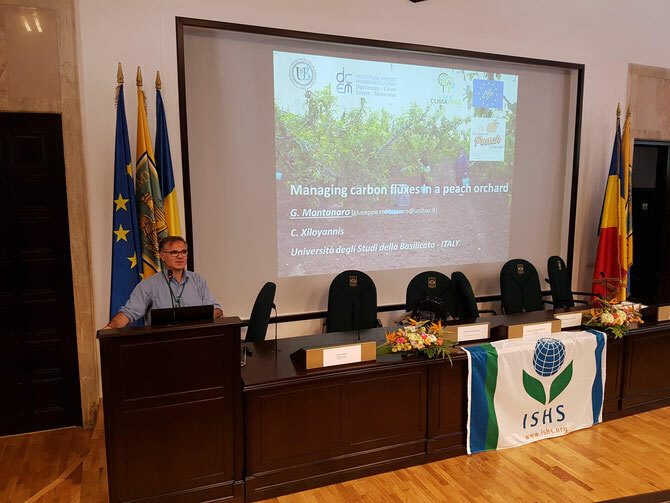 DiCEM worked on the revision of the paper titled “Mitigation of global warming potential of fresh fruit production through climate smart management” after the remarks received. 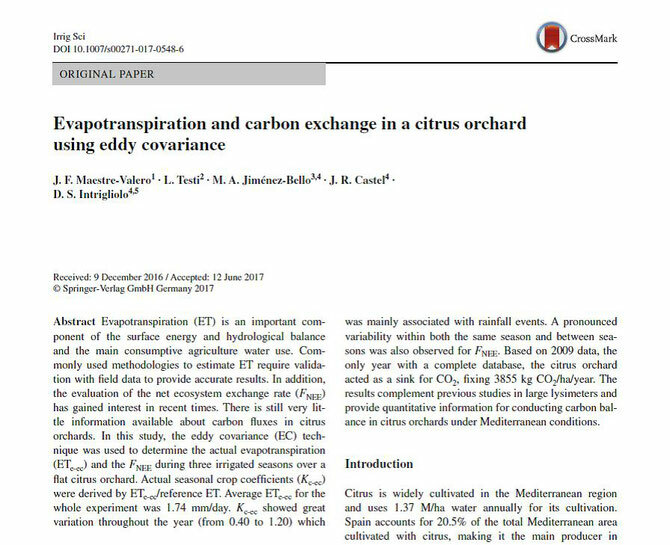 DiCEM submitted the revised version of the paper titled “Orchard management, soil organic carbon and ecosystem services in Mediterranean fruit tree crops” and finalised its publication in the international journal Scietia Horticulturae, 217: 92-101, DOI: 10.1016/j.scienta.2017.01.012. DiCEM submitted a paper titled “Mitigation of global warming potential of fresh fruit production through climate smart management”. Dissemination of project's progress and results at JUMILLA with Engineering Students and Technicians from Irrigators Community (2 days)” by CSIC. 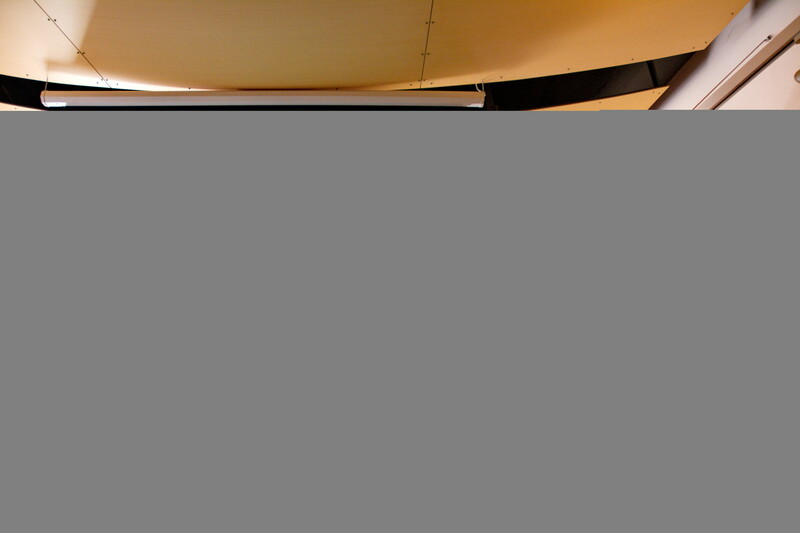 Assistance to the 4PRIMA meeting at CIHEAM Bari (12 -13 December). During the meeting, Diego Intrigliolo explained some of the results about water and carbon balance footprints to the assistant to the meetings which were the funding agencies from the Euro-Mediterranean countries and other international institutions such as FAO and ICARDA. EraNet DESERT, coordinated by Università di Bari. A presentation about the Project results and activity has been carried out during the course of the seminar ReQpro about “RECLAIMED WATER USE IN MEDITERRANEAN AGRICULTURE” by CSIC. 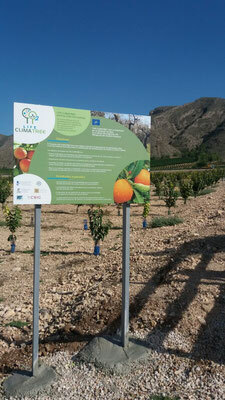 A poster about CLIMATREE project in Spanish has been designed and printed which will be used for all the Spanish dissemination activities. 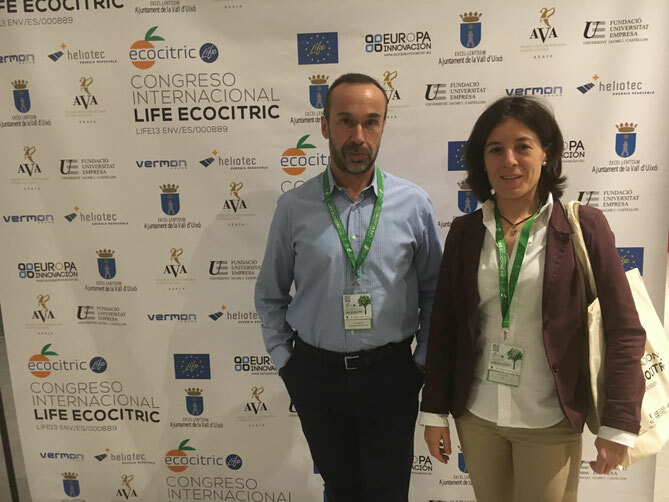 Participation of AUA in the Networking Event of LIFE AgroClimaWater project. 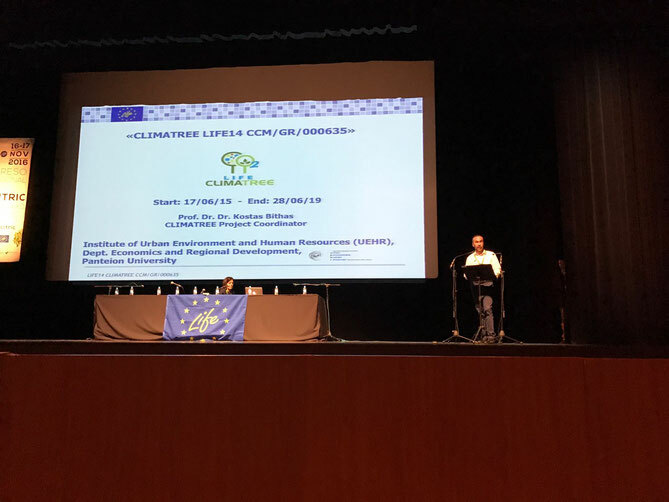 Participation in the 13th International Conference on Meteorology, Climatology and Atmospheric Physics (COMECAP 2016), where the abstract entitled “Life ClimaTree project: Accounting the tree crops carbon sequestration in S. Europe for current and future climatic conditions” by Stergiou J., E. Tagaris & R.E.P. Sotiropoulou was presented as a poster. 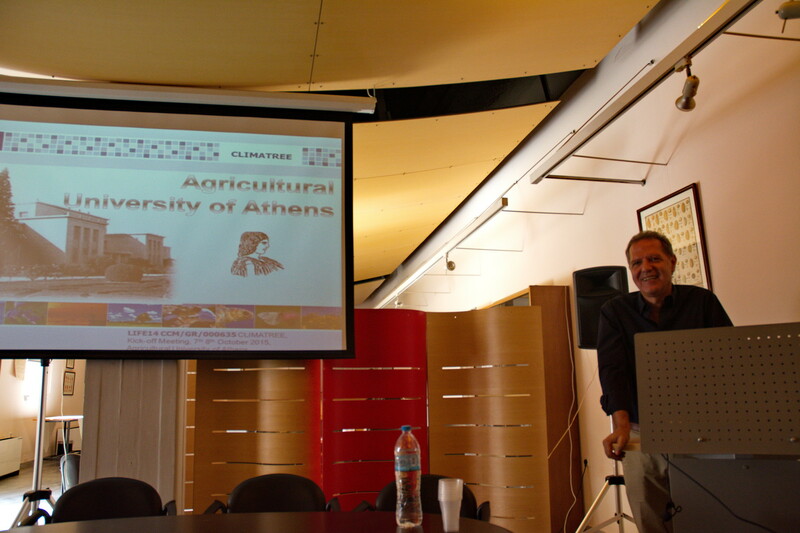 Prof. Xiloyannis delivered a presentation on the impact of Climatic Changes on agriculture focussing the tree crops and introducing the LIFE CLIMATREE Project. The meeting was held in the Grottaglie municipality (Taranto Province) on 23 September 2016. 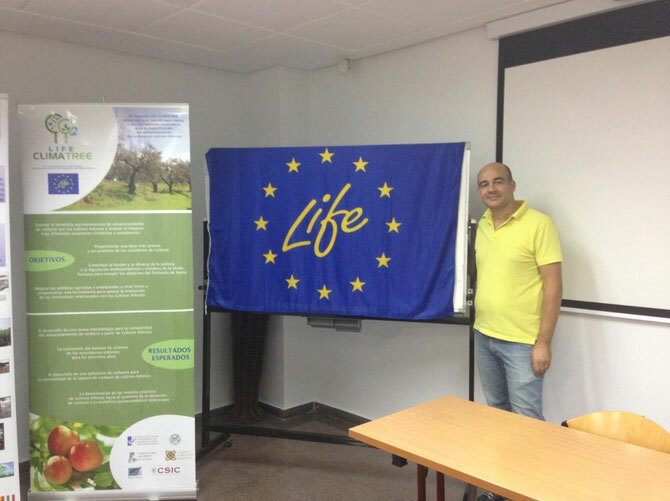 Establishment of Networking with LIFE ECOCITRIC Project (LIFE13 ENV/ES/000889). Establishment of Networking LIFE IPNOA Project (LIFE11 ENV/IT/000302). Establishment of Networking with ADAPT2CLIMA (LIFE14 CCA/GR/000928). 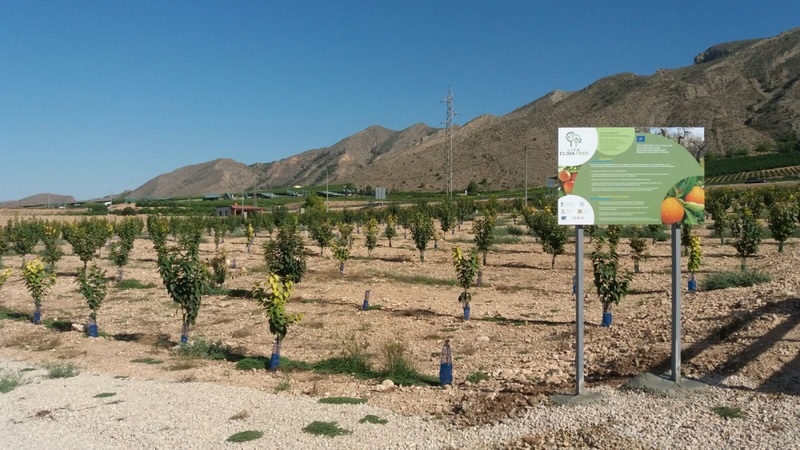 DiCEM submitted to the international journal GEODREMA a manuscript on ecosystem service delivered by fruit tree orchards focussing also the regulating service flowing from orchards because of their potential ability to sequester atmospheric CO2. Participation in Athens 2016 Life Info Day organized by the Hellenic Ministry of the Environment for the presentation of Climatree in the Life Projects Good Practices section (25th of July). Participation in Athens 2016 Life Info Day organized by the Hellenic Ministry of the Environment for the presentation of Climatree in the Life Projects Good Practices section (9th of June). 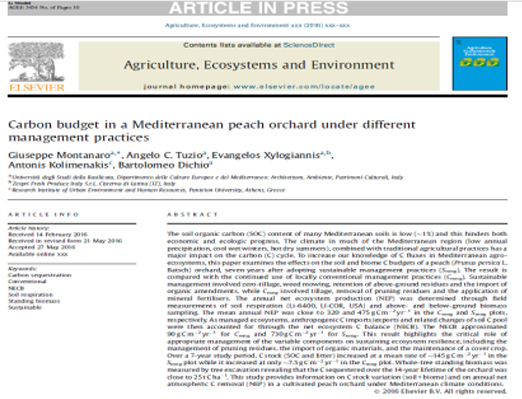 Publication of the following article “Carbon budget in a Mediterranean peach orchard under different management practices” by Montanaro G., Tuzio A.C., Xylogiannis E., Kolimenakis A., Dichio B., 2016, Agriculture, Ecosystems and Environment, in press, DOI: 10.1016/j.agee.2016.05.031. A presentation to the III Jornadas sobre curso de Gestión del riego has been delivered in order to give end-users about water and carbon footprint managements in irrigated fruit trees orchard. Update of dialogue with the Spanish Ministry of Agriculture (Ms. Marta Hernández de la Cruzmhcruz) and preparation of a report indicating the Spanish strategy towards the sequestration of CO2 from agriculture and the inclusion of LULUCF in EU report. DiCEM submitted an abstract titled “Climate change and the potential mitigation role of fruit tree orchards” to the III International Symposium on Horticulture in Europe - SHE2016 Chania, Crete (Greece), October 17-21, 2016. Meeting in the premises of the Hellenic Ministry of the Environment (18th April) between UEHR, delegates of the Ministry's Climate Change Unit and representative of DG CLIMA (Mr. Dimitris Zevgolis). 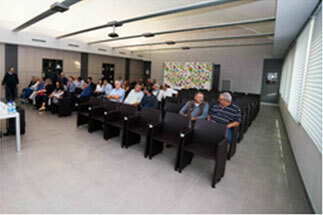 Meeting (7th of April) in the premises of UEHR between the teams of UEHR-UOWM-AUA and representatives of the Hellenic Ministry of Agriculture Department of Olive and Grapes Cultivations (Mr. Grammatikos and Mr. Kiokakis), and Mr. Iordanis Tzamtzis (Accel Co and national appointed representative of the LULUCF by the Hellenic Ministry of the Environment). Participation in the European Geosciences Union (EGU) General Assembly, Vienna (Austria), where the abstract entitled “LIFE CLIMATREE project: A novel approach for accounting and monitoring carbon sequestration of tree crops and their potential as carbon sink areas” by Stergiou J., E. Tagaris & R.E.P. 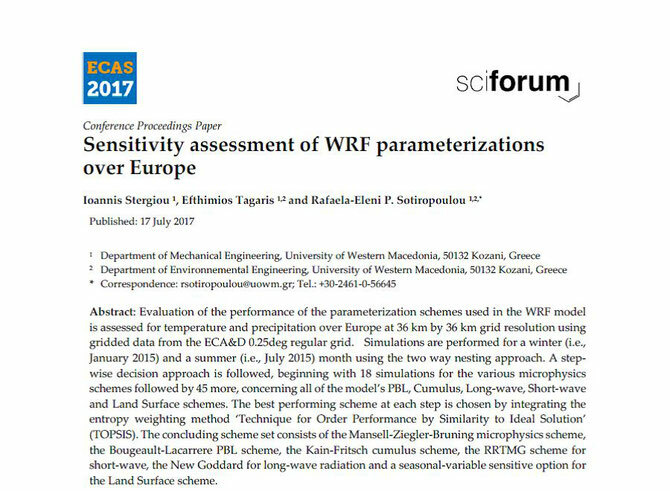 Sotiropoulou was presented as a poster. Contact with representatives of the Hellenic Ministry of the Environment for the presentation of the LIFE CLIMATREE project and the organization of a forthcoming meeting with the policy makers of the Ministry in the field of Climate Change. Meeting (9th of March) in the Hellenic Ministry of Agriculture, Department of Olive and Grapes Cultivations regarding the presentation of LIFE CLIMATREE's scope. 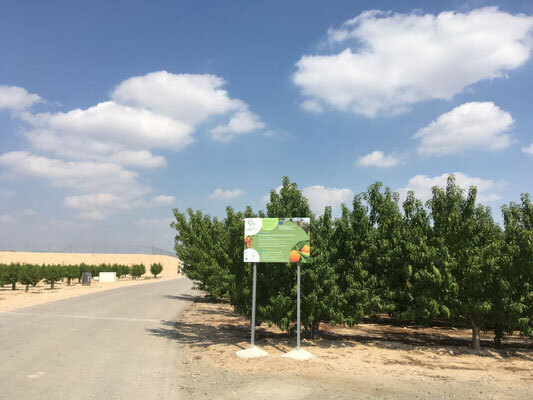 The associated beneficiary DICEM submitted a manuscript titled “Carbon budget in a Mediterranean peach orchard under different management practices” to the journal Agr. Ecosyst. Environ (ms n. AGEE15362). 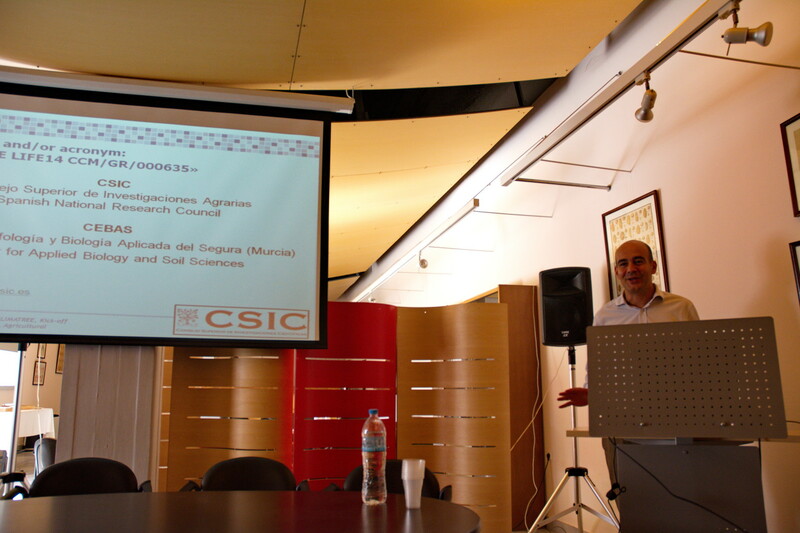 Contacts of CSIC with delegates from the Spanish Ministry of Agricutlure and the Environment. Communication with the Head of the Department of General Environmental Issues at Ministry of Environment, Energy & Climate Change of Greece, for the dissemination of LIFE CLIMATREE's scope and the design of the project's strategy in accordance with the National Strategic priorities. Communication with representatives of DG CLIMA for the update of EU priorities in the fields of "Greenhouse gas Monitoring Mechanism Regulation (MMR)" and possible policy reformations in the interest of LIFE CLIMATREE. Meeting of LIFE CLIMATREE's Project Manager in the premises of the Greek Ministry of Environment & Energy for the official presentation of the Project's strategic prioritization & objectives. Stergiou J., E. Tagaris and R.E.P. Sotiropoulou, LIFE CLIMATREE project: Accounting the tree crops carbon sequestration in S. Europe for current and future climatic conditions, 13th International Conference on Meteorology, Climatology and Atmospheric Physics, COMECAP, Thessaloniki, September 2016. Stergiou J., E. Tagaris and R.E.P. Sotiropoulou, LIFE CLIMATREE project: A novel approach for accounting and monitoring carbon sequestration of tree crops and their potential as carbon sink areas, European Geosciences Union (EGU), General Assembly 2016, Vienna, Austria, April 2016. Communication with Dr. G. Koubouris of Nagref Chania regarding the dissemination of LIFE CLIMATREE’s results within the Agricultural Associations of Crete. Communication with representatives from the Ministry of Environment and Climate Change, regarding the results of the participation of the ministry in the COP21 meeting and information about the potential of CLIMATREE's scope to be included in National Policy Proposal towards the EU. 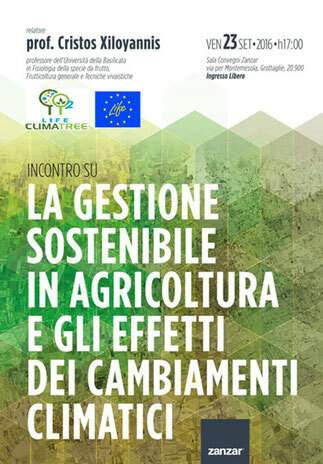 Elaboration of a (small) executive report which will be used by 3 National Ministries (Greek, Italian, Spanish) for supporting the inclusion of tree cultivations within the accounting of CO2 balance and its inclusion in forthcoming policy proposals of the DG Clima indicating the potential of tree cultivations for the Mediterranean countries in the absorption of CO2 levels. 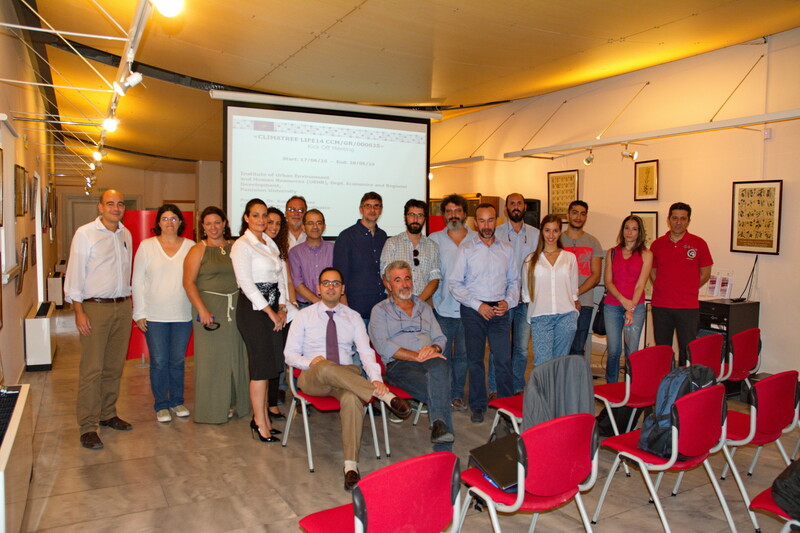 The official kick-off Meeting of the Project took place at the 7th and 8th of October in the premises of the Agricultural University of Athens. During the 1st day, the main managerial and financial issues were presented and the basic internal procedures were decided among the beneficiaries, for the successful continuation of the project’s outputs. During the 2nd day, beneficiaries presented an initial framework of all actions and a roadmap was decided for the preparation of each Action’s Deliverables.